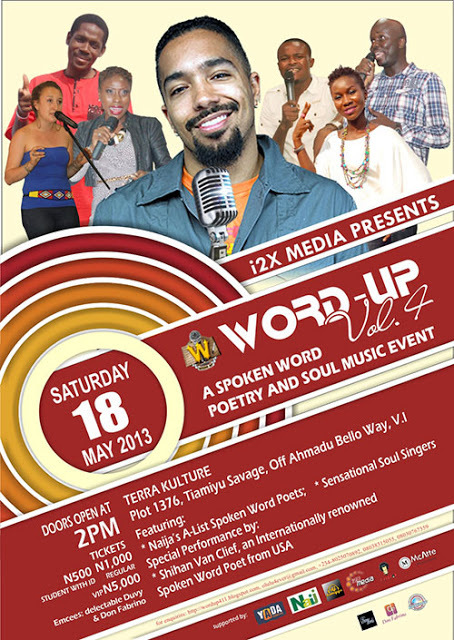 If you are a spoken word/poetry lover, then you should be in for words that get you high like ‘ganja’ this weekend. Attend Word-Up 4! This quarterly event will be holding at Terra Kulture for the first time since its inception and I bet it is an experience you will not want to miss. More so, an internally known Spoken Word artist called Shihan will grace the event with his poetic prowess. As usual, the event will feature the finest of Nigeria’s Spoken Word poets such as Obii, Dolapo, Efe Paul, Plumbline, Donna k, Torpedo, Enigmatic Olumide, Bob Ekat, Ndukwe Onuoha, Increase, Chris Eleri, Princepts, Atilola, Olulu (the host) and many more. There will be gate fee! But I bet you will get value for your money! If you want regular ticket it’s just N1,000 and if you are a VIP you pay just N5,000. Once again, the venue is Terra Kulture, Plot 1376, Tiamiyu Savage, Off Ahmadu Bello way, Victoria Island, Lagos. Time is 2:00Pm and the date is Saturday 18th May 2013. This is a good tip pаrtісularly to those new to the blogoѕpheгe. Sіmple but very accurate info… Many thanks foг shaгing this onе. Hi there everyone, it's my first go to see at this web page, and paragraph is genuinely fruitful designed for me, keep up posting these content. diet and others are doing my more popular 21 day juicing best full body cleanse for weight loss program. and prevents the occurrence of liver problems. opioids for several hours before beginning on buprenorphine.